The Soundwatch Boater Education Progamme has been running for nearly twenty-five years. Eric Eisenhardt, the current director, is into his third season. Before that, the previous incumbent had run the programme for twenty. It feels, though, as if Eric has all the decades’ experience in his eyes and memory. 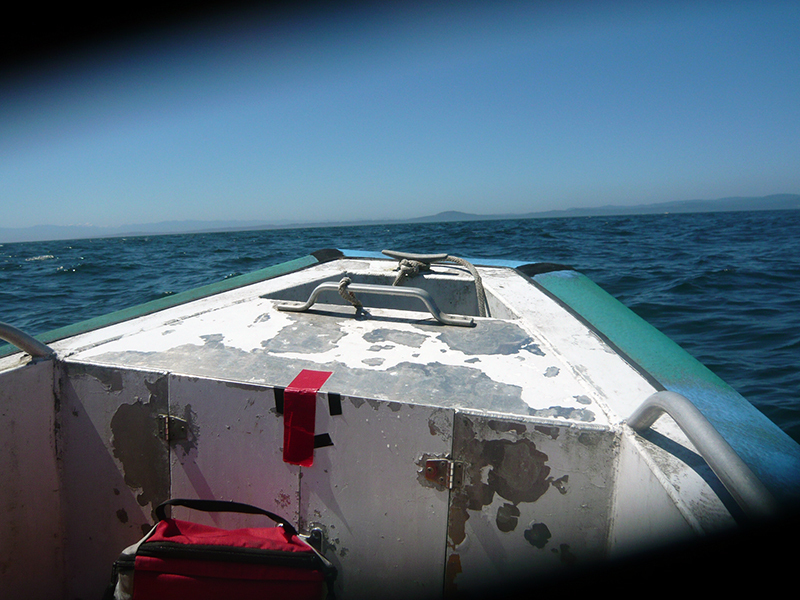 He knows all the boats and most of their captains, can identify the individual orca, knows the waters around San Juan Island, the rips and tears, and small passages, the quadrants split up into hundreds of small squares, the lines of sight and the landmarks. We’re about the same age, perhaps he’s a year or two older or younger, it’s difficult to tell, the thing that swings it for me are his good teeth, a kind smile hidden in his sun-tempered beard. The sun does this to people, it seems: makes you both older and younger than you are. Soundwatch educates people on the water about the correct whale watching guidelines, the same type of programme as run by CETUS out of Victoria. And indeed later that day we see Leah Thorpe and her crew on the water in their new boat, borrowed from the Canadian DFO. It is a slick black zodiac with brand new CETUS Straitwatch insignia. CETUS are dressed up in orange waterproofs and have an official-looking life jacket. It is much more formal and authoritarian than Soundwatch’s battered old skip, its backup, as its first boat is in the shop for repairs, and us, the four crew, two of us in shorts, Sarah in her running gear, and only John fully crewed like a fisherman in waterproofs, gumboot and hat. Although our faded blue life jackets all have the Soundwatch logo. But authoritarian isn’t always best in these delicate waters, where the work of both projects, to engage the public in what’s best for the whales, can be a nuanced, tactful business. The public, and this genuinely shocks but does not surprise me, isn’t always interested in what’s best for the whales. This is a wholly different type of programme to what I was invited to take part in the day before, in the belly of the Whale Museum. This is at the sharp end, where the actual welfare of an endangered species is at risk on a daily, often minute-by-minute basis, from boaters. Harassment of the orca in the waters can directly impact on their survival, and is a crime in both US and Canadian waters, but easier to police in US waters, because of the clear regulations. So Soundwatch and Straitwatch, as monitoring and research programmes that deliver just-in-time education, along with the Washington Department of Fisheries and Waters (WDFW) and NOAA, the “big cheese” explains John, the two proper enforcement bodies, police these waters and stop people from harmful boating behaviours. Then we leave Roche Harbour. As soon as we’ve trundled out of the harbour’s limits Eric asks us if we’re ready to go faster, and then throttles the Yamaha engine. A moment later the prow is up in the air and my hat is threatening to fly off and I can’t open my eyes for the wind, but it’s exhilarating, and I love it, especially as the water’s rough and we bounce along with my stomach rising and dropping, every now and then catching air, and once or twice really taking off, landing each time with a thud that jars the backbone. “It’s a little choppy,” Eric apologises. But it’s fun. The water is more like a river, roiling and rolling around, and throwing us with it. As we head south to find the whales we enter the fog we’d seen earlier that morning, but which cleared up as we went north. Immediately the whole atmosphere changes. It’s mysterious, heavenly, ephemeral. Like being inside a thought and seeing it for what it is. 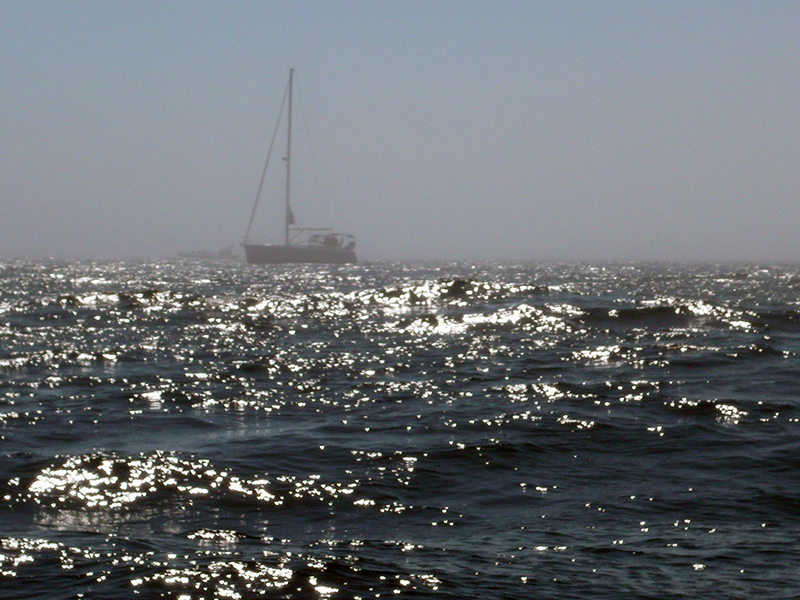 And then out of the fog we begin to see boats. These are whale watching tours out of San Juan, out of Victoria. The international border is a few miles away, cutting the waters down the middle between land masses. And where there are whale watching boats, there are, because of the excellent and connected whale spotting network, whales. There they are. Their dorsal fins breaking surface as they come up for air. 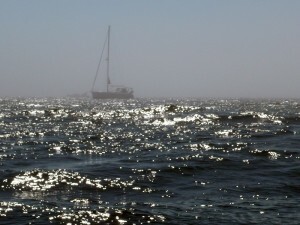 The spumes of water a dozen feet high, wisps of mist, and then their backs curving back into the sea, a sight of their saddle patch, a fluke breaking cover and slapping down. 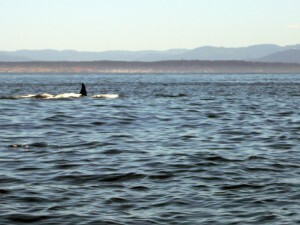 There are about ten or twelve orca, males, females and calves, in three or four groups. Eric and Sarah do their first boat count of the day. EC 6. (Eco Tour boats from Canada). EU 3 (the same, from the States). PM 2 (private motors). Others. MM, such as us, monitoring motors. Much of the work of Soundwatch is the recording of this data, the two pillars of the work of The Whale Museum being education and research. I’m not sure what I was expecting. 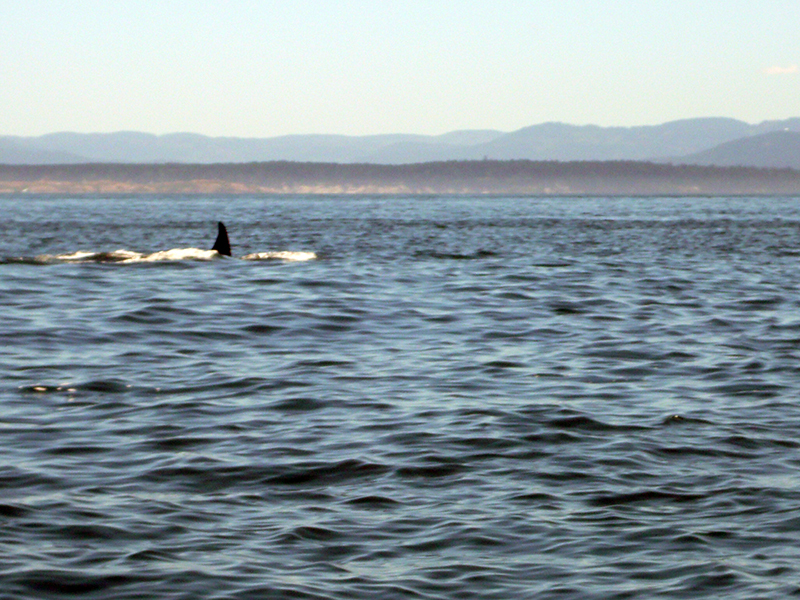 But whenever we spot the whales and when the different types of boats, the eco tours and the private boats, also spot the whales, there is a ruckus on the water to get close and to follow the orca as they head north along the west side of San Juan Island. It is a fleet, and I feel, more than fleetingly, sorry for the whales, whose lives are constantly under rowdy surveillance. They are followed all day, every day, but do not leave, because this is their home. But we’re here to help. Immediately we are in action, approaching a yacht that is half the distance from the whales as the whale watching tour boats, many of whom are part of the Pacific Whale Watching Association and, mostly, follow the Whale Wise Guidelines. We approach and the captain is, if not friendly then at least neutral, and says he knows the guidelines. We don’t ask him why he’s not following them. He says something about trying to back up, but those weren’t his boating actions. We offer him a brochure with the guidelines on it, and he says he doesn’t want them, before a member of his party says she does. My job today is to hand over the brochures on the end of a telescoping fishing pole, and I do this, I’m relieved, without missing or falling in. We spin around and head off, Eric shaking his head a little. John writes down the encounter on the recording sheet. The Whale Museum and the Soundwatch Programme has been recording this type of encounter for more than twenty years. It is this data that was, in part, critical to having the orca population here registered in 2005 as endangered, which led to the regulations being updated and, now, enforced. The whole encounter took less than a minute. 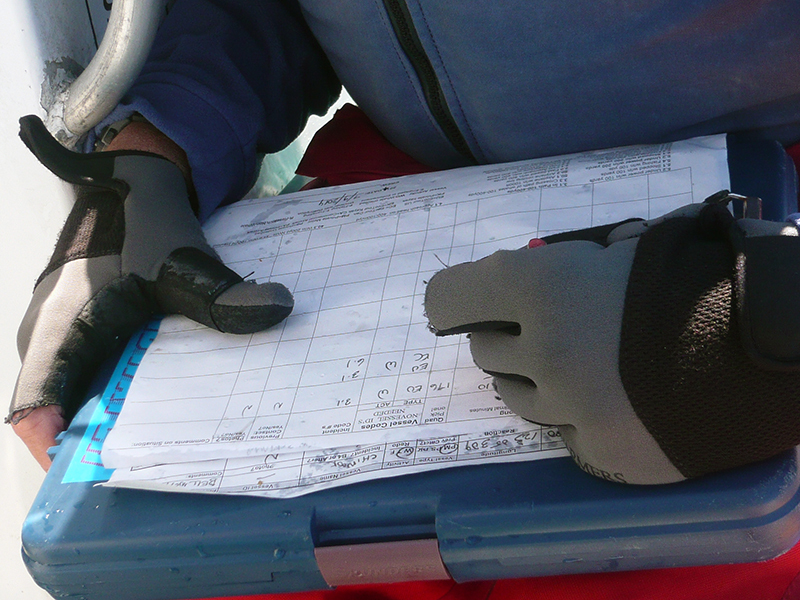 That’s all the time that the Soundwatch team have, with the boats moving on the water, with the distance between crews, to get across the basics of the guidelines, and to hand over the materials. It is intense education. But there’s actually no time to stop. We’re now heading over to a two-tiered power boat that comes at the whales along the coast from the north, directly in their path. When they pull up they are well short of 400 yards, which is unacceptable behaviour. If NOAA were on the scene they could issue a $30,000 fine for this. Soundwatch can only monitor and advise. We’re not there quick enough to intercept their course, but we pull up alongside. There are nuclear two families, two couples and their netball team of teenage girls, all sitting along the back of the boat with their camera-phones out, snapping away. “Yeah I know them,” says one of the guys. “We just came from over there,” he says pointing to the west. It’s a blatant lie, as we watched them steam in from the north and pull up. The steely faces continue. We don’t bother offering them a brochure. Eric runs through the guidelines, and then pulls away. “I get tired of their inventions,” Eric says when we’re out of earshot. But he smiles all the way through the encounter. His job is a diplomatic one. Not for the first time on this trip I come to believe that one of the most important assets a human can offer for the benefit of the animals they are trying to help is a smile. As Mary-chris Staples said, a smile can be an invitation to engage. Without this opening up, change is often impossible. John is scribbling down on the encounter sheet. He looks up at Eric. “How would you rate that?” John asks. There is a scale of human interaction for the encounter that needs recording. Eric thinks about it. “Poor,” he says, after a while. 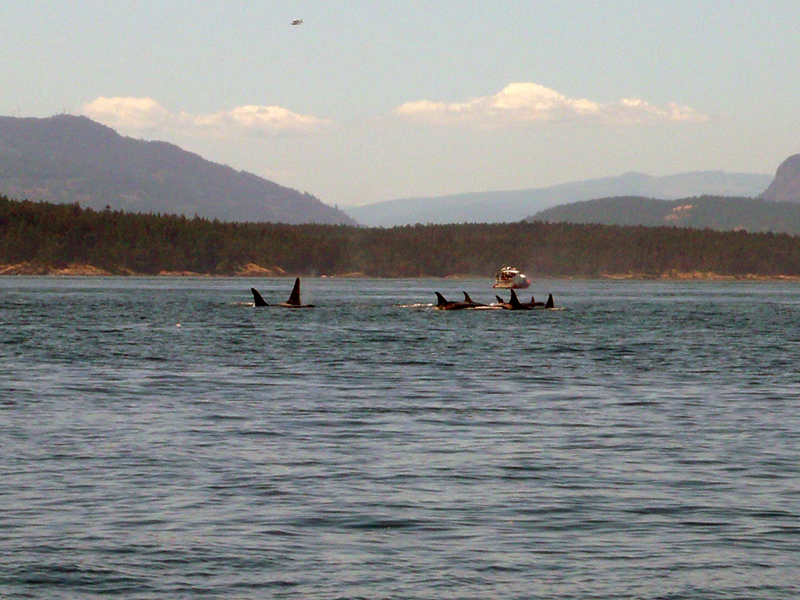 A little while later when we look back, we see the boat has pulled out of the line of the orcas’ progress. Later on I keep a check on that boat, and yes, they stay with the fleet after that warning. The intervention made a difference, for now. The next few hours are filled with boat counts every half hour, the recording of every incident one of us spots, and a number of interactions with private boats and yachts who seem not to know about the guidelines. Some, like the Wind Witch, out of San Francisco, are genuinely unaware of the whales. They leave Mosquito Pass, a notorious point for boats crossing the whales’ path, heading for California. “That’s great,” says Eric, although they’ve essentially already crossed the orcas’ path. We move around to the other side and pass them a leaflet, which they take gladly, smiling, and follow Eric’s guidelines to wait with the fleet. Others suggest they know the regulations—one guy even waves his brochure at us while barely stopping from his photo-taking—without strictly following them. Each time, Eric instructs John to write down another incident in the shorthand code that makes the job easier. Eric knows each of the codes by heart, of course. “That’s a 3.1 and a 5.3, PM, transiting,” he says. John marks this down, as well as the name and registration of the boat, on his two sheets, incidents and encounters. 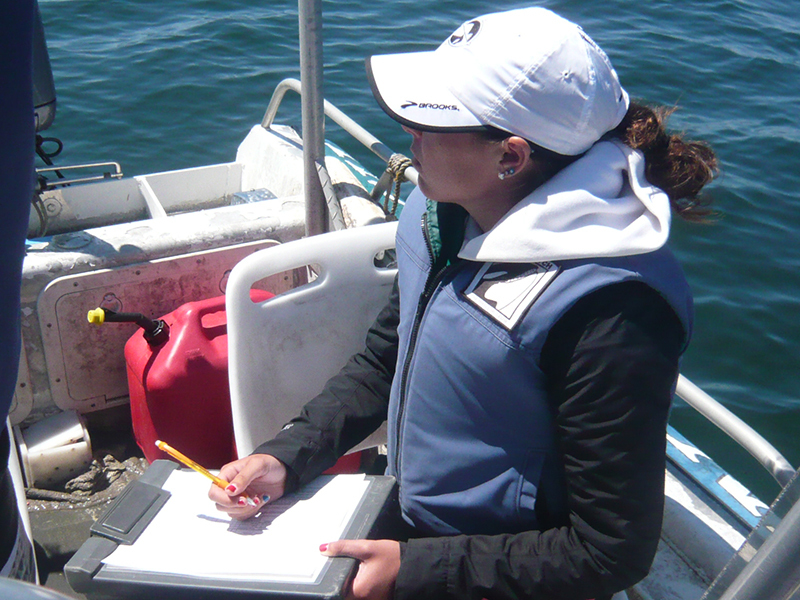 Sometimes we have to put our own boat down on the incident sheet because in attempting to get to the private boats before they infringe the regulations and get too close to the whales, we’ve done so as well. Once or twice we’re right in the whales’ path. “MM 3.1” says Eric. “One of the other drivers says if you’re not infringing once or twice a day, then you’re not doing your job,” says John. Eric agrees. If you’re too far back then you’re not close enough to get to the private boats before they do harm. It’s a fine balance, but a risk that has to be taken sometimes. Because it’s a tricky business. The whales are not all in one group, and can change direction at any time. Sometimes the private boats and yachts get genuinely caught up in the swings and sashays of the whales. But then you get some boats that are reckless and arrogant, like this one, as we watch it literally chasing behind the very line of the whales’ path, less than a hundred feet behind. This is cutting right over the whales, and is beyond unacceptable. It’s one of the times we also get too close to the whales. Eric approaches but the captain palms us off and swings away. I watch as a couple on the prow use their high-powered lens to get their photos. They don’t back off, but we do, of course, needing to get out of the way of the whales. But then the WDFW have seen what happened, and approach us, and Eric explains. “That’s what we needed to know,” one of the officers says, and goes after the boat. We watch as the WFDW officers give the boat a $1000 ticket. A wildlife crime has just been committed, and the perpetrator has been punished on the spot. I feel strangely righted. When the orca need to rest, they line up flipper to flipper. They are voluntary breathers, unlike us, for whom breathing is automatic. So when they are ‘sleeping’ one of the pod stays awake and breathes, and in their almost-unconscious state, the others hear this and come up for air as well. Eric flaps his arms around as he tells me this, imitating a dozy orca, and it makes me laugh, as if we can all understand the state they are in, that relaxed type of napping that we experience on a warm sunny afternoon, or in the morning after not enough sleep. They are lined up like this for much of the latter part of the day while we are on the water, as they follow the coastline up to Boundary, on their way to the Fraser River. We are in Canadian waters now. This is the most peaceful part of the day, when the whale watching boats simply chug along four or five hundred feet away in a line all heading north and east, and the orca are all together, so it makes it easier to stay away from them. This is the moment when we sit on the water and get a little drowsy ourselves. In twelve minutes Eric and Sarah will do their last boat count of the day. John has no more incidents to report, and Eric is unworried, as all the PMs have disappeared, so we will head back in time for the Whale Museum’s softball game in the Island League. For the rest of their circuit with the flow tide northwards, the orca will remain relatively unbothered, and then return south overnight with the ebb tide, with almost no boats to contend with, with no surveillance of their passing. “Well what do you think?” asks Eric as we’re almost ready to head back. “It’s intense,” I say, and all three of them laugh. “Yep,” he agrees. The work puts you in the present moment, making decisions based on what is happening that minute, as to what to do that’s best. And it is directly beneficial to an incredible wonder, this endangered species with its own social system, its dialects of communication, its greeting rituals, their distinct culture. It is also the accumulation of the data which continues to play a crucial role in the protection of this endangered species. It would be comfortable to imagine that. The resident orca having their favoured paths through the water untouched by tour boats or private, not relying on this intense, fast turning monitoring and intervention. The Whale Museum, like many, if not most, organisations of its type, never have enough funding to do all the things they would like. Eric is both Soundwatch Coordinator and Research Curator, and the two jobs are too much for one person. Of course during the summer the whale watching tours run into the evenings, when Soundwatch are not on the water. And private boats can come out any time. One of the most obdurate populations to shift, both physically in their boats and in terms of mindset, are the fishermen. The only thing to move them, usually, are NOAA. But Eric doesn’t give up on them. Conversations can make effective conservation, even with the fishermen who want to be in the same waters as the orca, both, of course, being after the same pink prize: salmon. Back at Snug Harbour we tie up the boat and stow away our life jackets and head back to the truck. On the way we stop and talk to a guy at the resort, who asks who we are and what we’re doing. Eric explains, talks about the different volunteer roles that Sarah, John and I have been playing that day. The guy looks up at Eric. “You mean if I have to come out with you I have to work?” he jokes. We all laugh. “Sure,” says John. “You don’t get to whale watch. I had my nose in a spread sheet all day. And it’s true. I didn’t get to whale watch. In fact, for a long while, I was focused more on the boats than the whales. Even though I did get to think a bit longer about the experience, ponder on my questions, take a few photographs. We were never, intentionally, as close as any of the whale watching tour boats. Once or twice we were incredibly close, but moved away as quickly as possible. And yet if my day was not spent watching whales, that was because it was a day of being with them, in their environment, in a way that was respectful, even beneficial, to their needs and their survival. In the evening I feel good. Working for the whales does this to people, it seems: makes you both less and more significant that you really are.